Bruce Jaffe, Fairfield Prep swim coach, after his team won the Boys CIAC State Open Swimming championships at Yale University in New Haven, Conn., Saturday, March 17, 2012. 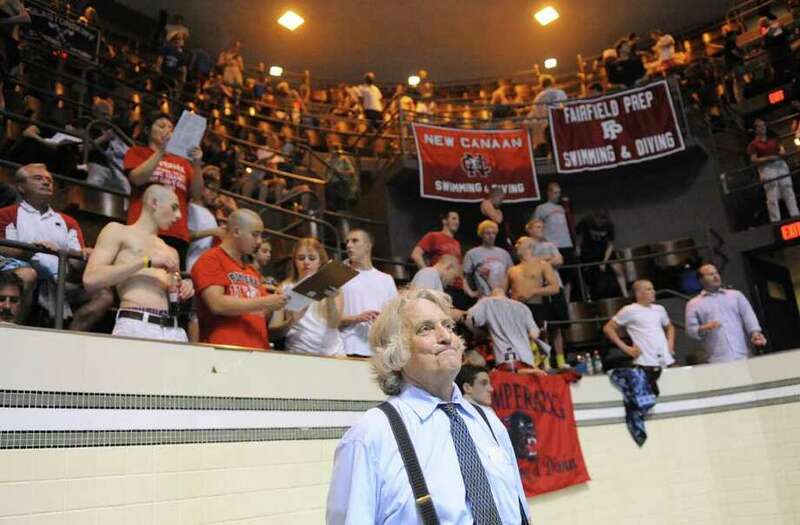 The Fairfield Prep swimming team gave beloved head coach Bruce Jaffe the perfect retirement gift on Saturday. Jaffe left Yale University proudly holding the State Open boys swimming championship trophy after his team put the finishing touch on an absolutely perfect season. It wasn't easy, but the Jesuits proved they were the premier team in the state, edging a determined Brookfield team for the title Saturday before a packed house at Yale University. Ironically, the Jesuits needed a favor from one of their biggest rivals, Greenwich, to secure the Open championship. Trailing Fairfield Prep by 9.5 points heading into the final event of the meet -- the 400-yard freestyle relay -- Brookfield needed to win the event and have the Jesuits place fourth to claim the Open crown. Fairfield Prep placed fifth, but Greenwich stepped up, winning the event in 3:10.74 and the celebration began for the Jesuits. Registering a number of impressive performances, Fairfield Prep finished with a team score of 412, while runner-up Brookfield recorded 407.5 points. Greenwich, which won the State Open last winter, placed third (310), followed by Amity Regional (289) and Darien (269). Indeed, Jaffe and everyone on the Fairfield Prep team knew it needed some help entering the 400 freestyle relay. The Jesuits swam to their fifth-place seeding, but Brookfield was the event's top seed. "Terry Lowe (Greenwich's coach) came up to me before the event and said, `You need help, don't you? ', and I said `Yes I do,' " Jaffe said. "Our kids swam a great race, but I needed those other positions to hold off Brookfield." Jaffe announced his retirement after 46 years at the helm at the SCC Championships two weeks ago. "When coach told us he was retiring we told him that we were going to win the SCC, Class LL and State Open titles, which is something that's never been done before by our team," Fairfield Prep tri-captain Matthew Connelly said. "We felt that we had no other option -- we needed to win this title for coach Jaffe." Brookfield's 400-yard freestyle relay team of touched the wall in 3:11.13, good for third place behind Greenwich and Darien (3:11.11). "We are a small team compared to some of the other top teams that competed here today, but our guys gave it everything they had," Brookfield coach Brian Reiff said. "We are going to pick our chins up and celebrate what was an amazing season." Brookfield began the meet with a bang, winning the 200-yard medley relay in an All-American consideration time of 1:35.60. The foursome of Jeff Magin, Matthew Moen, Jack Dunn and Daniel Krensta finished ahead of Fairfield Prep, which touched the wall in 1:36.95. Greenwich placed third (1:37.74), followed by Notre Dame-West Haven and Amity Regional. Fairfield Prep sophomore Bjorn Davis placed second in the 50 freestyle, clocking in at :21.14, just behind senior Michael Smigelski of Southington (:21.55). Fairfield Prep led in the team standings through five events with 178 points. Brookfield stood in second (148.50), followed by Darien (116) and Westhill/Stamford, which was also sparked by a first-place finish from sophomore diver Sean Burston on Thursday night. Greenwich found itself in sixth place after the 50 freestyle (108). Magin of Brookfield placed second in the 100-yard butterfly, finishing the race in :51.67. Berlin junior Dan Klotz took home the title with a :50.28 finish and Sheehan senior Joshua Bjornberg took third (:51.79). Bryce Keblish of Fairfield Prep was fifth (:52.05) and Anderson from Westhill/Stamford placed sixth (:52.37). "I'm very happy with my time in the butterfly," Magin said. "I always take it out slow so that I have something at the end. "I'm so proud of our team. What we did here today against this competition was incredible. We have a small team, but we work very hard and we showed how good we were today." Keblish also placed sixth for Prep in the 200 individual medley. "I give Brookfield an immense amount of credit, they deserved every point they got," said Keblish, only a freshman. "But we worked very hard too and it paid off in the end." Davis placed third in the 100 freestyle for Prep (:46.79), an event that was won by Barlow's Michael Pilyugin (:45.94). Moen was the runner-up in the 500 freestyle (4:38.61) and Magin placed second in the 100 backstroke for Brookfield (:51.69). "It feels good to finish second in a race like that against the top swimmers I was going against," said Moen, a junior. "Our effort and performance today was amazing, especially considering we were one of the smallest teams out there." For Bryan Dougherty, one of Prep's few seniors, the season was truly one to remember." "It was magical, we wouldn't have wanted it any other way," Dougherty said. "It was a storybook ending for us -- the perfect way to end the season." Said Jaffe: "This young team gave this old man an incredible going away present. I'll always remember them."